Everyone of us use some kind of backup storage device, I had always preferred Seagate, but my colleague recently purchased Western Digital My Passport 1TB, when the product pack arrived he felt they had forgotten to add the hard disk inside cause it was almost weightless, it much smaller & lighter than it's competitors. I would always recommend this to anyone who wishes to purchase a portable hard disk. Maharashtra is a big state in India and offers an amazing variety of lip-smacking dishes. Though some people in the country consider Maharashtrian cuisine to be a bit too hot, few can stay away from it, so tempting it is! Maharashtra is a treasure trove of wonderful vegetarian dishes. It also has some great non-vegetarian dishes that are special to this region. The following list of popular Maharashtrian foods will give you a good idea of what the region is all about. This is a popular Maharashtrian dish and is easily cooked in households. The easy availability of ‘Poha’ or rice flakes makes it possible for a Maharashtrian to offer this to anyone dropping by his home at any point of the day. Though it is eaten as a breakfast item most of the time, some people even like to eat it as a light lunch or dinner. There are a number of variations eaten of this simple dish. One is prepared with onions, while one is prepared with boiled potatoes while a different one is made with vegetables which are in season. Though this is a dish that was mainly eaten by rural people, the last few decades have seen its appearance in good restaurants in the cities as well. It is a simple dish that is nourishing and filling and prepared with lentils, jowar and bajra. This is another vegetarian breakfast item that is eaten in Maharashtra and other parts of the country as well. Made with the product of the Sago Palm, this nourishing food is one of those items which are allowed while fasting is done during festivals in the state. Prepared with lots of nuts, dried fruits and coriander leaves, this Khichdi is also a favorite among people who are sick and want something simple to calm their stomachs. The Vada Pav is a typical Indian snack. Easy to prepare and no-fuss to eat, this is a snack that is served by lots of local street food vendors who dot the state. It is actually an Indian burger. This dish is prepared with a boiled potato filling deep-fried pastry that is sandwiched between two pieces of Pav or bread. It is usually served with a variety of chutneys, both sweet and sour. In the cities of Mumbai and Pune, the Vada Pav stalls get the maximum amount of attention though they are also easily found in other parts of the country as well. This is a special lentil soup prepared in the state. Aamti is spicy, sweet and our; all at the same time. The Aamti is served as an everyday staple in most Maharashtrian homes. This is a special Maharashtrian sweet dish made with hung and dry yogurts. Fresh and dried fruits and nuts are used in this dish. Mangoes are also sometime added to create a dessert that is simple yet somehow exotic. Though the Shrikhand is available in other parts of the country, the best of it is found in this state. Flipkart.com is my favourite online store to buy books, I have even bought a digital camera from Flipkart. Last week, my best friend told she'll be leaving for London and I wanted to send her some books, I ordered them on Flipkart and request them to deliver it within 2 days and to my surprise they delivered it they very next day, wow! Thank you Flipkart. Yesterday my best friend asked me why I didn't give her leaves on Dusshera, for a moment I thought I heard her wrong, then I asked her, "What leaf? Why?". She told me that there is a custom where people exchange leaves and receiving these leaves was considered to be lucky. Well, I didn't know any of this till now, so I did some research to find out about the custom. 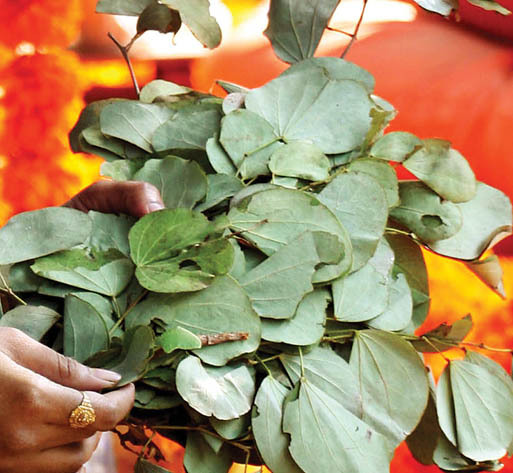 Primarily, there are two tree leaves that are used, one is Apta/Apati & Shammi. Also, there are two legends surrounding the custom, one related to the Ramayana & other to Mahabharata. One legend has it a young man named Kautsa in Ayodhya after attaining his education from his guru Varatantu offered him Gurudakshina (Gurudakshina refers to the tradition of repaying one's teacher or guru after a period of study or the completion of formal education) which he declined to accept, but when Kautsa insisted Guru Varatantu asked for 14 crore gold coins. Kautsa approached Lord Ram for help, and Lord Ram promised to help him and asked him to wait near the Shammi & Apta tree in his village. In 2 days time, Lord Ram with the help of Lord Kuber - Lord of wealth - showered gold coins from the leaves of Shanu and Apati Tree and the leaves of the trees became gold coins. Kautsa collected the coins and gave 140 million gold coins to Guru Varatantu. The rest of coins were distributed to the needy by Kautsa. This happened on a Dussehra day. To commemorate this event people collect leaves of Apta tree and present it as sona or gold. Another legend says it is believed that in the Mahabharata, the Pandavas after wandering in the forest for 12 years, hung their weapons on a Shammi tree before entering the court of king Virat to spend the last one year undercover. After the completion on the day of Dussehra, they brought down the weapons from the tree and declared their true identity. Since that time the exchange of Shami leaves on Dussehra day became a symbol of goodwill and victory. Apta tree, Bauhinia Racemosa, is also known as 'Sonpatta', being considered to be as valuable as gold for its medicinal value. Apta is used as a cure for digestive diseases such as diarrhoea and dysentery & it has anti-tumour qualities and is used to treat the first stages of cancer. There might be numerous stories associated with the distribution of these leaves, but one thing is that people are always seen to be wishing the good of the other while giving them the leaves.